Located at Neredmet crossroad, Evergreen Organic Store & Cafe is easily accessible. It is a spacious store that has all things natural and fresh and it moonlights as a cafe too. Eating farm fresh produce and using natural self-care products leads to a healthy lifestyle. So, when Evergreen Organic Store & Cafe opened six months ago, people in Neredmet could not have been more excited. 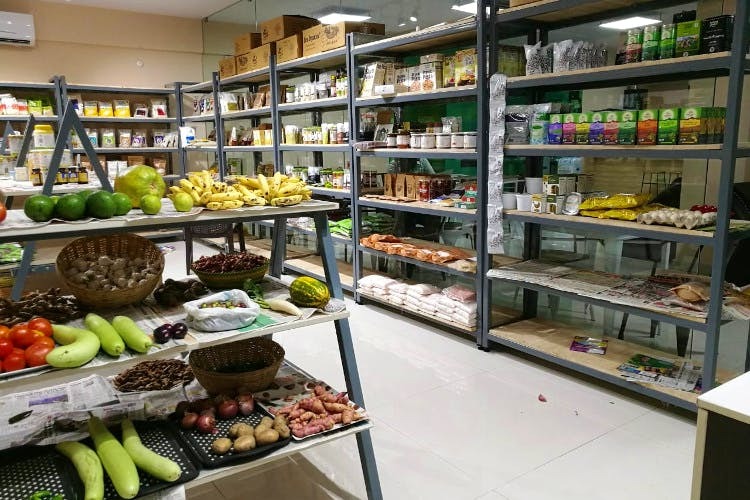 This store has groceries ranging rom fruits and vegetables to grains, pulses and oils arranged neatly. There is a section dedicated to cosmetics and toiletries like lipsticks, face packs, essential oils, handmade soaps from Ancient Living. The adjoining cafe serves a variety of teas, coffee, pasta, burger, juices, and thick shakes, all of which are devoid of chemicals and truly refreshing.